As the week is nearing completion, it is high time for think tank Strati to look back at the outgoing week’s key and memorable events with own commentaries and forecasts from own experts based on what have already been done with regard to hammering out topical issues high on the agenda for the South Caucasus nations. For nearly three decades, the Nagorno-Karabakh conflict with the occupation of Azerbaijan’s 20-per-cent of territories has remained the most pressing problems for the South Caucasus as a whole and for Azerbaijan in particular, and aggressor Armenia and its patrons, latest hopes for the resolution of the conflict have again suffered a set-back at the hands of Armenian Prime Minister Nikol Pashinyan both at home and in Germany - Europe’s driving engine - in the hope of encouraging investment in the Armenian economy under full control of the Russian businesses. The Armenian prime minister’s remarks that Azerbaijan should first make compromises on the Karabakh conflict was interpreted by official Baku as a blow to latest tangible hopes for the revival of the talks to resolve the conflict. Azerbaijani pundits immediately saw the Kremlin hand behind the latest developments and Pashinyan’s U-turn from early signs and consent of both parties’ to the conflict to prepare their nations for a peaceful resolution. Baku and Yerevan are locked in a conflict over Azerbaijan's Armenian-populated breakaway region of Nagorno-Karabakh. The OSCE Minsk Group, which is co-chaired by France, Russia and the United States, mediates peace talks between Armenia and Azerbaijan. The breakaway region is not a party to the talks. The news of the sale of Russian jets to Armenia amid unfolding developments around the conflict can only be viewed in the context of the Kremlin reluctance to torpedo positive signs and Pashinyan’s consent to bow to Moscow’s behind-the-curtain pressure. Pashinyan breaks off the negotiating process quite deliberately. And it is unlikely that it is completely on his own initiative - many signs indicate that the negotiating process is being disrupted by Russia on behalf of Armenia. And Moscow has a clear, albeit a cynical reason. Let us be realistic: The current stage of the dialogue, which looked so promising a few days ago, was moderated by the United States in the person of John Bolton, and Moscow, hot on the heels of the visit of the U.S. president’s adviser to the region and his statements on Karabakh, showed its discontent with Washington's invasion of its sphere of influence. Moscow has never wanted the resolution of the conflict and a full settlement of the problem is hardly part of Moscow's plans - it needs a conflict in the working condition both for putting pressure on Baku and Yerevan, and for destabilizing the situation near the oil and gas pipelines from Azerbaijan that are unprofitable for Russia. Moscow abruptly changed anger for mercy and presented promised gift to Pashinyan in the form of Su-30 fighters, though it is clear that Armenia could not even pay for them theoretically. So, it was necessary to pay in political kind, according to a Baku pundit. The breakdown of the negotiations, first, sharply increases the likelihood of a military scenario in the region with a balance of forces that is not most favorable for Armenia. Azerbaijani former foreign minister Tofiq Zulfuqarov also sounds pessimistic about unfolding developments around the Karabakh conflict. Since the time Nikol Pashinyan came to power, his position has constantly become tougher. Pashinyan is interested in strengthening his power and is fully aware that any of his steps towards a compromise will be met critically by his numerous opponents. Given this, in the situation that is taking shape, he is taking increasingly radical steps each time, he said. Azerbaijan renewed call on the occupying Armenia to pull its troops out of occupied Azerbaijani lands in response to remarks by Armenian Prime Minister Nikol Pashinyan who ruled out discussing "territories in exchange for peace" formula. "Armenian Prime Minister Nikol Pashinyan has to understand that resolving the conflict will give impetus to the independence of Armenia and first of all create a new political situation, as well as open great economic opportunities for the population of Armenia," the Azerbaijan Foreign Ministry said. Media outlets in Azerbaijan traced closely and lambasted the Georgian government over the erection of a monument to Armenian fighter Mikhail Avagyan in ethnic Armenian-populated Akhalkalaki District. The overall view in Azerbaijan is that how the Georgian government may turn a blind eye to the erection and inauguration of the monument on January 20 when Azerbaijan marked the anniversary of the victims of the Soviet occupation and killing of innocent civilians. Official Baku is upset about the strategic partner’s disrespect for Azerbaijan’s interests and it is still waiting for a solid and substantial reaction. 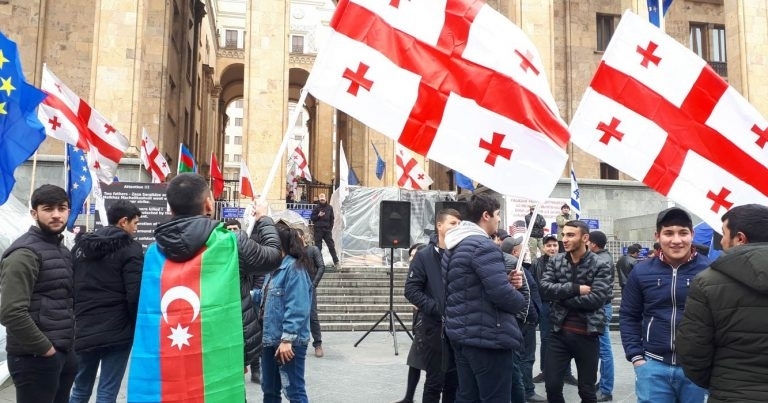 One simply cannot understand what makes Georgia to go against its interests by some steps it takes when official Baku recognizes Georgia’s territorial integrity and gives to it all-out support at home and internationally. Official Tbilisi’s indifference to the erection of a monument to the Armenian terrorist in Georgia is a pure provocation that cannot be properly understood and interpreted. At a time when Azerbaijan is making all-out attempts to have the conflict resolved either militarily or peacefully, the separatist Karabakh pretends nothing is happening around it and nothing has to do with it. Though this is wishful thinking and self-deception, since it hears and sees all developments around. Also the separatist entity is in the grip of the infighting under the carpet between those who want to replace the current separatist leader picked by defunct Serzh Sargsyan and those backed by Pashinyan, who wants to see his own man in the breakaway region. Former “defense minister” of Nagorno-Karabakh Samvel Babayan sees himself in the post of the breakaway region’s leader and plans to stand in a presidential election in Karabakh in 2020. However, Karabakh’s so-called former deputy prime minister Artur Aghabekyan also sees Karabakh's former state minister Arayik Harutyunyan as future president. I am not going to step down. The problem of my resignation is not being discussed in the region, separatist entity security council secretary Vitali Balasanyan said, when commenting on rumors about people in Karabakh believing that it was not ruled out that Balasanyan could be fired from his post of NKR security council secretary because of the opinions expressed at the Yerablur on Army Day. The Karabakh separatist is aggravating the existing confrontation between Yerevan and Xankandi. It is noteworthy that essentially, Vitali Balasanyan does not deny that Yerevan wants his resignation, but alludes that he is not going to resign, referring to Karabakh’s “sovereignty”.